At the west end of the village of Muirkirk is a layby which has a pyramidal cairn in memory of the Covenanters of Muirkirk parish, plus Airds Moss. There are also memorials to other locals. Among the those commemorated are John Loudon MacAdam, local poets, miners, Tibbie Pagan, etc. John Smith, shot near Lesmahagow but buried in Muirkirk kirkyard. 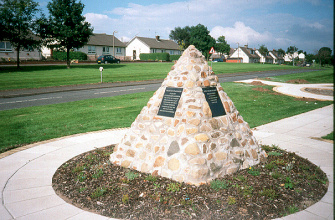 The stone cairn and information boards are located on the south sid eof the A 70 road, at the west end of the village.